Algorithms change. Fickle consumers. Unexpected trends (hello, Romphims). Deploying a successful digital marketing campaign can feel like winning the lottery in today’s ever-changing, multi-channel sphere. And consistently seeing KPI uplifts? That’s just Shangri-La. Except successful digital marketing is completely attainable and has nothing to do with luck. Some of the savviest brands are deploying digital marketing campaigns based on unique insights, attention to data and detail and a customer-first mindset. Leave luck to your brand’s competitors and slide into the driver’s seat like these top companies. A few tweaks made a big difference for Canada’s flag carrier. In a campaign with Persado, Air Canada was able to test 32 versions of an email to see which would best engage consumers, a major step up from the company’s usual A/B test. The results uncovered a new insight for Air Canada: Consumers responded well to Anxiety-driven language. Phrases like “Sitting down, [person’s name]? We’re thanking you with this” were opened 48% more times than Air Canada’s original idea of “Craving warmer weather? Our Florida sale is happening now.” “We had more success with words that we never have thought of using for marketing campaigns,” Air Canada business analytics leader Chantal Berthiaume told French-Canadian paper Les Affaires. Additionally, click-throughs were almost 220% higher when Air Canada directed consumers to “see deals” versus “book now” in the call-to-action button of the email. 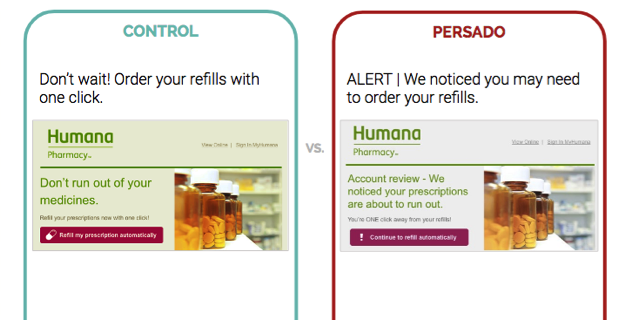 Persado’s AI platform played doctor for Humana Pharmacy’s digital marketing efforts in 2017. In one campaign, the leading prescription delivery service wanted to run an email campaign to increase engagement on its one-click prescription refill program. By tapping into Persado’s extensive database of marketing language and images, Humana was able to deploy a campaign with a message that sounded human. In turn, the messages inspired consumers to get their medication in a more automated fashion, reducing overall costs for Humana, and helping customers lead a healthier lifestyle: a win-win for everyone Humana’s email open rate for this campaign went up 22.8%. The click rate uplift was even more dramatic — 73%. At the 2017 Incite Group Marketing Summit, Humana Program Manager George Kipp told people the company was “empowered with information” because of Persado’s unique ability to generate content and provide quantifiable and transparent information on why the winning messages worked. Persado’s feedback doesn’t just drive digital marketing results, nor does it make marketers go into autopilot. Lulu Press Digital Marketing Manager Lali Szumowski said the tool inspired her team to think more creatively about email subject lines. “Having Persado really helped us step up our game,” Szumowski told attendees of a Persado, Oracle + Bronto and Lulu Press webinar earlier this year. And yes, Persado increased opens and even revenue, Szumowski said.